My nails are now nubbies again. I cut a little too much when I was clipping my nails. They were getting quite long anyways. I don't think I've ever had them this short for the blog before, but I really like them. It feels sort of...liberating to have nubs. It's kind of like a weight is being lifted from your nails if that makes sense lol. They should grow back in a few weeks, but for now we'll have to deal with my nubs. Today, I have a swatch of NYC's Lincoln Square Lavender for you. Lincoln Square Lavender is a pink creme with a hint of lavender. It's definitely a pink polish though. The name is a bit misleading, but at least it's catchy though. This is two coats without a top coat. The formula and application was good. This is the quick drying nail polish and it did dry pretty fast. It was a little over a minute, but still a fast dry time. Honestly, I'm on the fence with this polish. I like the color, but I don't love it. It's a bit boring. It's not really unique to me, which is why I won't be wearing this too much. To spice it up a bit, I added some pizazz! Well, China Glaze's Pizazz to be exact. This glitter really makes the color pop out more. I like it better with the glitter than by itself. Overall, I like this polish but it's a bit boring. It's not going to be a go to polish for me. 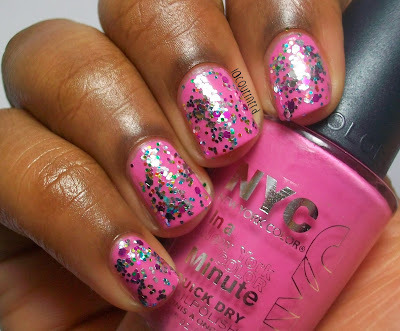 I think it looks way better with some glitter on top, so that's how I'll be wearing this polish the next time I wear it. What do you think of this polish? 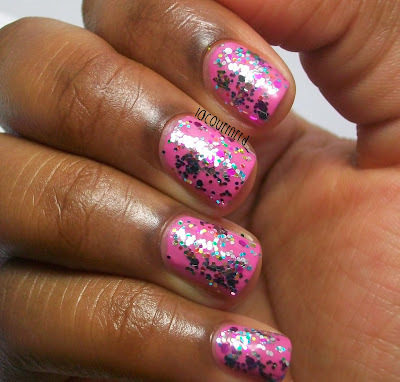 What's your favorite glitter polish? Thank you! 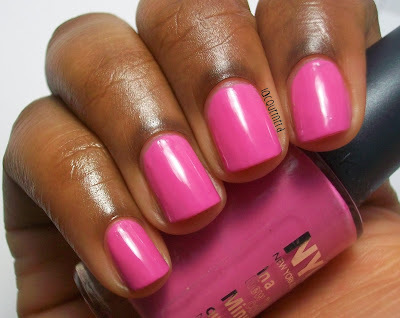 Yeah, this is a really girly pink. Too girly for my taste, but I do like it lol. Sally Hansen-Cherry, Cherry Bang, Bang!